Posted on July 12, 2018 by Marty Schoenleber, Jr. I will be preaching on having a Passion for the Gospel this week. And this is one of the questions I will be addressing. A few months ago, I had a conversation with a woman who had some serious questions about evangelism and discipleship and how the two worked together. If you have spent any time reading here in the blog, you know that my own perspective is that dividing the task of “making disciples” into evangelism and discipleship is neither helpful, nor biblical. You can read about thathere and here and here and many other places. But there is another problem. When we make this first division, we begin to make other divisions. 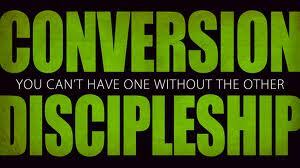 We begin to divide believing from doing, gospel proclamation from gospel justice and care for the poor.